Five items found at the Politico filed late Monday or early Tuesday reported that supporters of Bernie Sanders at the Iowa caucuses, while watching a live feed of Hillary Clinton's speech late Monday evening, began chanting "She's a liar!" The chants grew until they "took over the room," and didn't stop until Sanders campaign officials cut off the live feed being shown. This is barely news in the rest of the establishment press, which has obsessed over the Ben Carson-Ted Cruz-CNN controversy, devoting an obviously inordinate amount of time to it and, as Cruz himself has shown, getting it wrong in the process. Justin Miller at the American Prospect reported that, for Sanders supporters, "There was palpable anger at Clinton as MSNBC described her speech as a declaration of victory." 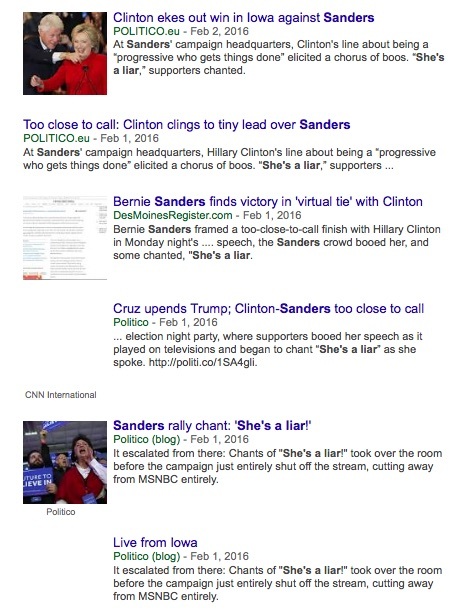 A Google News search done at roughly 2 p.m. Eastern Time on [Sanders "She's a liar"] (typed as indicated between brackets, sorted by date) returned roughly 27 results. Other than the five Politico entries already mentioned, the Des Moines Register is the only establishment press outlet which mentioned the "She's a liar" chants virtually as they occurred. A few of the results since that evening link to a column Washington Post columnist Dana Milbank pleading with Sanders supporters to "Cut Clinton Some Slack," praising her as "a candidate of steadiness at a time when the electorate wants iconoclasts." Good luck with that, Dana. The New York Times finally acknowledged the existence of the "She's a liar" chants on Thursday, long after they occurred. ... For the generation that researchers say has been the most bombarded with marketing slogans and advertising pitches, Mr. Sanders, a former mayor of Burlington, Vt., has a certain unpolished appeal. ... On Monday in Iowa, Mr. Sanders defeated Mrs. Clinton among voters ages 17 to 29 by 70 percentage points, greater than the 43-percentage-point margin by which Barack Obama won that age group in Iowa in 2008. ... Some 87 percent of likely New Hampshire primary voters ages 18 to 29 said they would vote for Mr. Sanders in the state’s primary on Tuesday, compared with 13 percent for Mrs. Clinton, according to a UMass-Lowell poll conducted Feb. 1 to 3. ... The discomfort, and, in some cases hostility toward Mrs. Clinton among young voters is striking. Some of them, feeling the pinch of economic hardship or the burden of college loans, suggest she is too cozy with big banks and corporate America. But polls also show they do not find her trustworthy. The scene at the party for Mr. Sanders on the night of the Iowa caucuses captured their feelings. As Mrs. Clinton appeared on several large projector screens, telling her supporters she was “breathing a sigh of relief” to learn of the Iowa results, some young members of the Sanders crowd booed loudly. “I am a progressive who gets things done for people,” Mrs. Clinton said, setting off more heckling from the Sanders supporters. “She’s a liar,” the group chanted angrily. The distressed Times reporters reported little evidence that Mrs. Clinton is doing anything about her problem getting support from the under-30 crowd. But then again, what can she do, given that in 1996 Times columnist William Safire labeled her "a congential liar," and that she's done nothing but confirm Safire's negative assessment in the 20 years which have followed? Perhaps, by choosing to reveal what it has previously ignored, Chozick and Alcindor were also telling Team Clinton, "See, we're not going to continue to protect you if you keep screwing up like this."